At GYDLE inc., I work on optical mapping problems, and sometimes I find solutions to these problems. To tackle efficiently any problem, the error model for the problem must be understood. To write software that deals well with a given type of data, this type of data has to be understood, and one must be able to separate the good data from the bad data. Once in a while, I read scientific papers to keep myself up to date with the optical mapping technologies. I created a Mendeley group where I maintain a list of papers on optical mapping. The list is available here. Some of these papers describe error models for optical mapping. According to the social network LinkedIn, I have been working on optical mapping problems at Gydle Inc. (with Philippe and Marc-Alexandre) for 8 months so far. I previously worked at Argonne National Laboratory (with Fangfang and Rick and other people). The Bioinformatics Adventure continues. Yes, I am still doing bioinformatics. No, I no longer work on assemblers. I have not worked on any genome assemblers for a while. As of now, I am more an aligner person than an assembler person (see "Sense from sequence reads: methods for alignment and assembly"). I schedule my time around activities related to the development of optical mapping software -- mainly an aligner and tools to parse / analyze the resulting alignments. We use g++ and clang++, CMake, and Qt. Right now, we are using the option -std=c++11 (short for C++ 2011). Here is a list of Gydle optical tools. Our main tool is gydle-optical-aligner. It is multi-threaded, and aligns sequences to references. The sequences are typically optical molecules and the references are optical maps. Here are some examples of optical alignments (with the format of BioNano Genomics, and the format of Gydle). ==> The reference is the same. Everyday, we need to fix the behavior of our software. This is achieved using a test suite with many test cases which in turn contain many assertions. So far, this approach is paying off because we rarely have regressions. However, there is of course a cost (human time) to maintain a test suite. I found the article Good Coding Practices written by Nicholas Nethercote very interesting. In it, the author introduces the concept of envelope of known behaviour. For the Gydle Inc optical mapping business case, our envelope of known behavior for our optical aligner mostly consists in the capability of aligning things to other things, within a range of scaling factors. Even with its very small size, Gydle Inc. does have a culture. The tenets at Gydle Inc are not numerous, but they are important. I tabulated a list that I find to be true. The reference is always right, but the reference can evolve according to newly obtained evidence. Everything must have a name: sequences, assets, maps, references, contigs, and so on. We use these name to better communicate and describe what is going on. We always test something on a whole dataset and not on just a sample. The paradigms implemented in our aligners use several phases: indexing, searching, baby-HSP (high-scoring segment pair) generation, HSP sorting, HSP binning, HSP optimization, filtering. It is generally better to combine different data types to alleviate their respective weaknesses. "Hey Joe, how are you ? Can you align the molecule "1" on the map "1" and report back to me if you are getting anything good at all. So, say the mapping project used many flow cells, then you are possibly stuck with many optical assets with the same exact name. Yeah, you could have 3 molecules with the name "1". Adding a namespace, like "FC1:1", "FC2:1", and "FC3:1" promptly solves the problem, but this is not possible directly because, as stated above, the BNX, CMAP, and XMAP format specify that integers are to be used for the names. If you look at Illumina sequences, they also have names that are not integers. I received my Spark Notebook. 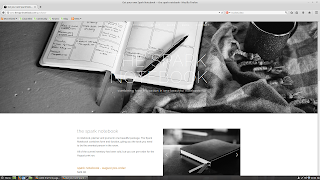 What is the Spark Notebook, you may ask. The Spark Notebook combines form and function. The Spark Notebook project raised funding on Kickstarter too. The way I see it, the Spark Notebook is an agenda (a 6-month agenda) with additional features. These features include (from the guide) the yearly planning pages, accomplishments, the monthly planning pages, the weekly planning pages, the inspiration pages, and the note pages. The monthly planning pages include something called the 30-day challenge. According to creator Kate Matsudaira, the 30-day challenge feature is useful to help start (or break) a habit. The Spark Notebook comes with a guide. On this website, some of the text is white with a background image which makes it hard to read. For example, consider the screenshot below. How did I learn about the existence of the Spark Notebook ? One of my hobbies consists in watching videos on the Amazon Web Services (AWS) YouTube channel. I like these videos because they are usually easy to understand although the subject may be a bit abstract. In particular, I watch the videos about AWS products. One example of this is the video called Introduction to Amazon S3 which explains in 3 minutes the general idea of the Internet storage service called S3 (Simple Storage Service). The other types of videos that I like on the AWS YouTube channel are those about satisfied AWS customers. The customer experience videos are usually animated by AWS Chief Evangelist Jeff Barr. One of the videos I watched was Kate Matsudaira, CTO of Decide.com. I like the customer experience videos because they usually mention what the customer is doing with AWS (value proposition / business model) and also the AWS building blocks that the customer is using to make things happen are also listed. So, in that video, I got to know more about Decide.com. Then, I continued my adventure. I searched for Decide.com to try their offering. However, I was not able to do so because Decide.com was acquired in 2013. The next logical step was to look for the next accomplishment of Kate Matsudaira because I was not able to experiment with Decide.com because it had been acquired. That's when I found popforms. for the modern leader" through online courses. These courses are called sparks. I found this interesting, because I think self-reflection is important for improving who we want to be. This company (popforms) was also acquired by a bigger fish (Safari Books Online). At that point, I was thinking that this entrepreneur probably has a secret sauce, and that perhaps she shared it in the form of a book. This is how I discovered the Spark Notebook. Also, when I discussed the Spark Notebook concept with my significant other, she said that she has been reading Kate Matsudaira's blog for years. So, Kate Matsudaira is an entrepreneur, technologist, creator, and also a role model. I think that the Spark Notebook is a great product. An exascale computer is an imaginary system that can sustain one exaflops (10^18 floating point operations per second.) Such an object is needed in science and engineering, mostly for simulating virtual versions of objects found in the real world, such as proteins, planes, and cities. Important requirements for such a computer are 1) memory bandwidth, 2) floating point operation throughput, 3) low network latency, and so on. 2 of the many challenges for possibly having exascale supercomputers by 2020 are 1) improving fault-tolerance and 2) lowering energy consumption. (see "No Exascale for You!" An Interview with Berkeley Lab's Horst Simon). One typical solution to implement fault tolerance in HPC is the use of the checkpoint/restart cycle whereas in most cloud technologies fault tolerance is instead implemented using different principles/abstractions such as load balancing and replication (see the CAP theorem). The checkpoint/restart can not work at the exa scale because there will almost always be a failing component at this scale. So, an exascale computation would need to survive such failures. In that regard, Facebook is a very large system that is fault-tolerant and that is based on cloud technologies rather than HPC. The fact that fault tolerance has been figured out for a while now in cloud technologies allowed the cloud community to solve other important problems. One active area of development in cloud computing in 2015 has been without a doubt that of orchestration and provisioning. HPC is still making progress on solving the fault-tolerance problem in the HPC context. A significant body of research output is coming endlessly from UC Berkeley's AMPLab and other research groups and also from Internet companies (Google, Facebook, Amazon, Microsoft, and others). The "cloud stack" (see all the Apache projects, like Spark, Mesos, ZooKeeper, Cassandra) is covering a significant part of today's market needs (datacenter abstraction, distributed databases, map-reduce abstractions at scale). What I mean here is that anyone can get started very quickly with all these off-the-shelf components, typically using high levels of abstractions (such as Spark's Resilient Distributed Datasets or RDD). Further, in addition to having these off-the-shelf building blocks available, they can be deployed very easily in various cloud environments, whereas this is rarely the case in HPC. One observation that can be made is that HPC always want the highest processing speed, usually on bare metal. This low level of abstraction comes with the convenience that things are built on a very low number of abstractions (typically MPI libraries and job schedulers). On the other hand, abstractions abound in the cloud world. Things are evolving much faster in the cloud than in HPC. (see "HPC is dying, and MPI is killing it"). One thing that is typically associated to HPC and not with the cloud is the concept of having a very fast network. But this fast-network gap is closing, and the cloud is catching on in that regard. Recently, Microsoft added RDMA in Windows Azure. Thus, now the cloud technically offers a low latency (in microseconds) and high bandwidth (40 Gbps). This is no longer an exclusive feature of HPC. In the end, as Sun Microsystems's John Cage said, "The Network is the Computer." The HPC stack is already converging to what is being found in the web/cloud/big data stack (see this piece). There are significant advances in cloud networking too (such as software-defined networks, convenient/automated network provisioning, and performance improvements. So, the prediction that can perhaps be made today is that HPC and cloud will no longer be 2 solitudes in a not-so-distant future. HPC will benefit from the cloud and vice-versa. What the future hold in this ongoing convergence will be very exciting. This survey paper is very comprehensive and highlights how HPC (called exascale computing even though there is no operational exascale computer as of today) and cloud can meet at the crossroads. This article reports on a very large supercomputer that is running OpenStack instead of the classic HPC schedulers (like MOAB, SGE, Cobalt, Maui). This piece is a provocative, yet realistic, depiction of the current state of popularity of various hpc and cloud technologies (surveyed using Google Trends). Thorium is an actor model engine in C 1999. It uses MPI and Pthreads. The latency (in Thorium) when sending small messages between actors recently came to my attention. In this post, LTTng-UST is used to generate actor message delivery paths annotated with time deltas in each step. I have been working with perf for a while now, but found it only useful mostly for hardware counters. I typically use the following command to record events with perf. Note that ($thread is the Linux LWP (lightweight process) thread number. As far as I know, perf can not trace things like message delivery paths in userspace. This week, I started to read about tracepoints (perf does support "Tracepoint Events"). In particular, I wanted to use tracepoints to understand some erratic behaviors in Thorium. LTTng-UST, the Linux Trace Toolkit Next Generation Userspace Tracer, has quite a long name. A friend of mine (Francis Giraldeau) is a researcher in the field of tracing. He helped me getting started with LTTng-UST. I also got some help from the lttng-dev mailing list. The data model for defining and storing tracepoint events (called CTF or Common Trace Format) is probably the big difference between LTTng and the other tracers. The LWN papers (part 1 and part 2) about LTTng are very interesting too and they discuss the CTF format. Investigate (analyze tracepoint data using various techniques). In the BIOSAL project, we already have (primitive) tracepoints, but the data gathered is basically analyzed (printed or discarded) in real time, which is probably a bad idea in the first place. Here is a little explanation: message (the first argument) is the provider, actor_send is the event name, and message (the third argument) is the data that we want to submit for tracing. To try LTTng, I added a define (#define thorium_tracepoint tracepoint) to use LTTng's tracepoint(). I also added a tracepoint in thorium_actor_send (actor.c) with the line below. in the Makefile (option: THORIUM_USE_LTTNG). I then started the Spate application, and ran lttng list. I ran it again since the LTTng daemon was not running. Great. This is very simple to use. Now, I am ready to do actual tracing (with the tracepoint "hello_world:my_first_tracepoint"). The first thing to do now is to create a session. Then, I enable all userspace tracepoints for my session and start tracing. Then I run my application. Once my application terminates, I stopped tracing and destroyed my session. Tracepoint data files were written in a directory in my home. There are now 135 tracepoint files (all related to "channel0" for this single LTTng tracepoint session). So far, I did step 1) Instrument and step 2) Trace. The third and last step is 3) Investigate. One easy way to inspect LTTng traces is a tool named babeltrace. By default, this tool dumps the events in ASCII text in the standard output. Let's create useful tracepoints now. Below is a list of tracepoints in the delivery path of any message in Thorium. Here is a delivery trace for a message delivered within a node (suspicious time delta is shown in red). A message sent between nodes also shows this high delta (4 ms). According to the LTTng traces, the way messages are dequeued in Thorium is not very efficient. I am currently in an improvement phase where I break, build and improve various components of the system. I am working on a couple of very large public metagenomics datasets from the Department of Energy (DOE) Joint Genome Institute (JGI). These datasets were produced in the context of the Grand Challenge program. Professor Janet Jansson was the Principal Investigator for the proposal named Great Prairie Soil Metagenome Grand Challenge ( Proposal ID: 949 ). Professor C. Titus Brown wrote a blog article about this Grand Challenge. Moreover, the Brown research group published at least one paper using these Grand Challenge datasets (assembly with digital normalization and partitioning). Professor James Tiedje presented the Great Challenge at the 2012 Metagenomics Workshop. Alex Copeland presented interesting work at Sequencing, Finishing and Analysis in the Future (SFAF) in 2012 related to this Grand Challenge. Jansson's Grand Challenge included 12 projects. Below I made a list with colors (one color for the sample site and one for the type of soil). I thank the Jansson research group for making these datasets public so that I don't have to look further for large politics-free metagenomics datasets. Table 1: number of files, reads, and bases in the Grand Challenge datasets. Most of the sequences are paired reads. At Argonne we are using these datasets to develop a next-generation metagenomics assembler named "Spate" built on top of the Thorium actor engine. The word spate means a large number of similar things or events appearing or occurring in quick succession. With the actor model, every single message is an active message. Active messages are very neat and there is a lot of them with the actor model.